As a professional PCB manufacturing online platform, ALLPCB.com not only provides high quality and low cost PCB manufacturing service, but also we offer information that is essential in PCB manufacturing process, helping customers or hobbyists to have a better understanding about PCB industry. Solder paste plays an important role in SMT (Surface Mount Technology), and it is widely used in PCBA. However, only a few people have a good command about solder paste while most of people know less about it. 1. What is solder paste in SMT? Solder paste is the combination of flux and solder powder, which plays an essential role in SMT. It offers a solder medium to form solder joints in reflow process with enough electrical and mechanical strength. Solder paste has certain viscosity at ordinary temperature and is able to mount the electronic components on initial positions. Solder is a kind of fusible metal with lower melting point than the metal being soldered. When solder melts, solder can wet the surface of metal being soldered and form the alloy layer on the connection to connect the metal together. Solder can be divided into several categories according to the difference of melting point, raw material and shape. Solder paste printing refers to the process to printing solder paste on the printed circuit board for the aim of connecting electronic components, which seems like painting on walls. The quality of solder paste printing is vital for the soldering of PCB board. There are a lot of elements to be considered for the best result of solder paste printing. 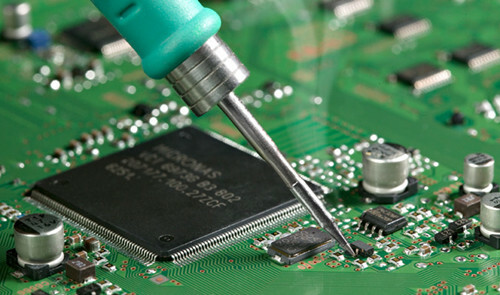 Solder paste inspection is the key step in PCB board assembly operations with SMT techniques, which aims to reduce the defective rate in SMT. Solder paste inspection machine is used to monitor and control one of the most crucial steps affecting the finished quality of circuit boards.